As I promised earlier, the pleasant series “Sunshine Voice” is here again for another refreshing nugget. Go out to the balcony, to the garden or the park with headphones on your head with this nugget playing; a glass of lemonade with ice cubes and mint leaf biting your palate. The summer is smiling for you. And here we arrive at another festive stage in my general mixtape nuggets celebration, the Folklorella series, that resembles another course of my deep-loving musical inspiration. Now you can discover the best authentic musical phenomena from around our globe. This mixtape contains folklore music that sometimes can’t be really called 100% authentic, but it definitely doesn’t leak to the ‘world music’ genre; that unfortunately doesn’t always contribute honor to the roots. Again, my general theme for assembling this jigsaw is my love for interesting melodies, harmonies and, of course, uncommon rhythms and grooves. It is very interesting to find some similar musical characteristics between distant cultures and times. The first track, for example, is from Japan and could be very confusing. There is a clarinet there with a mounding melody that could easily remind you of eastern European Polka, even slightly Jewish. The Japanese insanity increases with the track. In a track from Kyrgyzstan, we can listen to an interesting mix that can accidently mislead you to think that we hear a South-American melody. I also included some traditional classics from Rumania, a piece that is very familiar to the Jewish east European culture (this musical piece was usually played with a violin as the lead instrument, and here I chose to put the version of Zamfir, the pan flute player). This nugget is closed with a Yemen-Jewish representation with an honorable presence I can’t miss. It seems that I’m more of an astronaut than I think I am. A few days ago I met with my friend Alon Brayer, an artist through and through. He updated me about two albums that came out during the last year. One of them is Stereolab’s ‘‘Not Music’’, and the other is ‘’The Trip’’ by Laetitia Sadier, who is Stereolab’s leader. So, thanks to Alon for the tip. 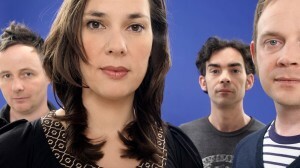 In the last decade, one of my greatest musical influences has been Stereolab. In my opinion, they include all the best raw materials for modern music creation: authentic integration of acoustic elements (every acoustic instrument, human voice or natural sound source) with electro-acoustic (electric guitars, electric basses etc.) and pure electronic (analog and digital) in one music piece. For those of you with a sensitive ear, it will be easy to detect the human character of the synthesizer that begins the track. 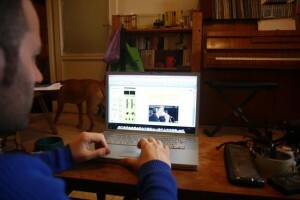 Most musicians these days prefer to create this kind of musical part with computer software, even if the instrument sounds like a vintage one. This way they can fit the part of the playing in the rhythm grid (“quantize’’ in the professional jargon) and then the playing would sound tight and sterile. Here we can listen to a very brave choice. On the border of Sisyphean (tedious) in the way that they choose to perform – the result is live and human, even though this track has a completely electronic approach. This track originates from their previous album, ‘‘Chemical chords’’, and actually it is very hard to find any resemblance between the original and the current version. For my own opinion (and many other addicted fans of the Lab), “Chemical Chords’ was a true disappointment compared to the other albums they issued since 1996. 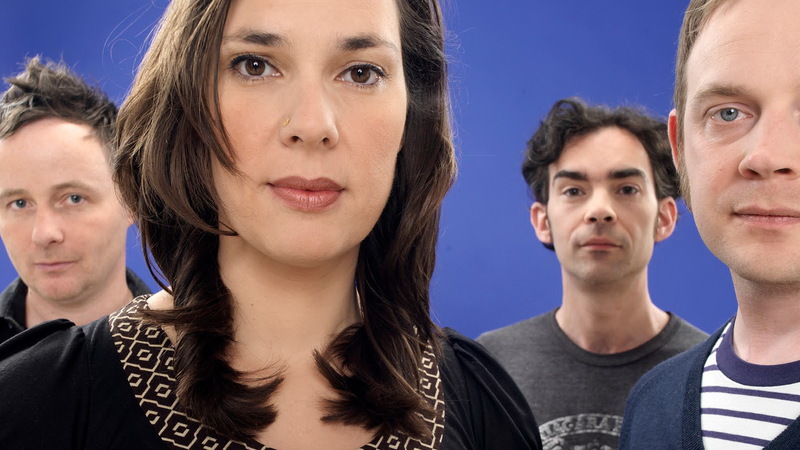 Stereolab started in 1991, but only in 1996 when their album “Emperor Tomato Ketchup” debuted did they make an interesting shift from a band that played monotonous Drone Rock to one that created melodic and very richly arranged and produced songs and pieces. They joined John McEntire from Tortoise as a music producer and additional player – this way you can distinguish his marimba and vibraphone typical playing and arrangements for strings and brass, which were absent in their pre-1996 albums. “Not Music’’ completely deviates for the last formal Lab release in 2008, “Chemical Chords.’’ After this release, the band announced they were disbanding. “Not Music’’ is actually a collection of leftovers from the “Chemical Chords” recording sessions, and it is really fun to discover that these leftovers are much more interesting than the materials chosen for the actual album. In general, it really thrills me to discover each time how this band is so fruitful. Along with their musical activities, they used to do several collaborations with other artists. For instance, Laetitia collaborated with Blur in one of my favorite songs of theirs, “To the End.’’ And if I mentioned Laetitia, she owns a big credit too for her first solo album, “The Trip.” Laetitia had some unpleasant reasons to begin working on this album – her sister’s suicide. Apart of the very personal and touching lyrics, I think this is the first time that I can pay attention to her singing as a writer rather than another musical layer as she used to appear on previous works. Until this album, Laetitia’s voice was screened with a lot of sound effects and manipulations, usually her vocal part in the sound mix was quite low, and for me it was like another musical instrument, not mention that her French accent made the lyrical comprehension harder for me. I think the texts were in weaker priority in previous works, and Stereolab naturally preferred to put the emphasis on the music. I was so amazed when I heard it the first time. Laetita always sounded so happy and positive to me in her previous works, like a shiny smiley sun, and here suddenly you can hear a completely different side of her, dark and fragile. This song is a type of sorrowful Trip-hop, outstandingly exciting. So I thought it would be an easy task for me to make an electronic mixtape…so I thought. Apparently, it’s a really hard job to find appropriate tracks. I really love electronic devices and instruments, but from the other side, I like the combination of electronic sounds with the intervention of the human hand, the acoustics, and the solid physical sense in the way they are easily distinguished. I went over several tracks and songs from different times and musical genres and chose these that really move something inside my body. Every time I’m surprised at how the music affects me. I can be very impressed by sophisticated production tricks, electronic or not, but in the end, if the music, harmony, and groove don’t integrate into one complete exciting and fascinating music piece, then the sound doesn’t leave me with a deep impression – such impression that will lead me to include it in that kind of a mixtape. A year ago I had a guest post on my good friend’s fascinating blog: the multi-artist, polymath Benjamin Esterlis, AKA Morphlexis. 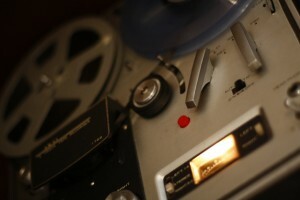 This post represents one of my greatest loves for the analog mediums in the world of sound. Some months ago I got an email from Amir in which he told me how he takes my mixtapes and records them over magnetic tape reels in a way that he can experience them at their full potential. Wait a minute. I read this line over and over again to be certain that those were the words. “Reels” and “magnetic?” Is there somebody out there who listens to these mixtapes exactly as I imagined how this type of mixtape would be played in a perfect world?! It took me a few minutes to wipe the excitement and sweat off and to come to my senses to write reply with a little quest: Tell, demonstrate, take photos! Over a one year ago I discovered this sacred wonderful blog. I found that Morphlexis was dealing a lot with issues I could relate to as a musical creator. I decided to sample from the presented mixtapes. First, I was so impressed with the delicate work of art created from the interesting overlaps between the tracks. The fact that the mixtape streams through continuous line without any silent breaks, and the incredible creativity and well-chosen selection of pieces – all surprised me. I was immediately completely captivated with the rest of the mixtapes on his blog. People who are familiar with me know how difficult it can be to please me with music… and Morphlexis does it for big! Now, we’ll examine one of my deepest ’scratches’ – my compulsive love for analog audio equipment. 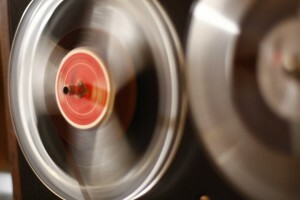 I guess most of you confirmed music lovers, know the general notions about analog recording formats. Now, I’ll present you my method for taking these digital mixtapes and making an improvement to the analog world. You can watch the video above. I downloaded the files of a mixtape, then opened my media player on the comp when it was connected to my stereo system constructed from decent parts: an analog receiver from the 1970s, a special model of Technics turntable from the 1970s, Akai reel-to-reel tape deck and ancient Wharfedale loudspeakers from the 1960s. 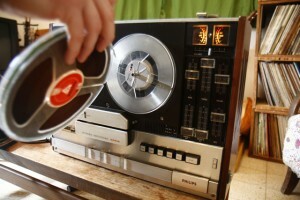 When the music plays through the receiver, I prepare my recorder and put a reel tape on. The audio reel tapes are exactly like the more familiar cassette tapes in their way of usage, the reels are just bigger and like cassettes you can record and erase over and over again. Then I put the recorder to ‘record’ mode but paused it. I watch the recording level meter and pay attention as it swings across the ‘0 dB’ mark. This is another advantage with analog recording: it can absorb ‘peak’ level sparks that digital format can’t deal with. When you have peaks on digital recordings they’ll play as distorted clips. I set the reel to a place I want the recording to begin (again changing the mode to ‘record’ and pause the machine), go back to the computer, set the mixtape to the beginning, release ‘pause’ on the reel deck and press ‘play’ over the computer. This is how the conversion is done. It is important to say that dealing with such equipment takes time and regular maintenance, but the final pleasure is more than worth it. Here I present some other process pics from and another cute device that I collected recently, the Philips N4416. It is more sophisticated than the featured Akai and works with an electronic mechanism while the Akai is completely mechanical. Still, I prefer the Akai sound because it works with vacuum-tubes, which only for themselves gives another chaotic colour for the complete sound experience. In general, I’ll add and explain more, and I make the recordings in the lowest recording speed over these recorders. Usually there are 3 speeds for recording on the domestic reel-to-reel recorders that were in production from the 1950s to the 1970s. As you lower the speed, the sound quality decreases. You lose the higher frequencies, but you gain more playing time and the analog side effects are bolder, which increases the analog experience for me. There’s nothing like the Israeli Friday afternoon to present the following mixtape nugget. And here you have my second “nugget” that was created by my compounding tools: Before the summer I added this “nugget” for the sunshine hours. This type of collection raises refined heat, a sort of good and calm feeling like laying under a big tree and staring at the sun flickering from under the leaves. Since I found several tunes that can fit to this puzzle, I let myself declare that this is the first mixtape in a series that’s continues in the future. This is my first ‘nugget’ that I present for the show. Actually, it isn’t a mixtape I created but an old recording of a radio show that produced and broadcasted in the late 1960s in Israel. This show was produced for the Passover holiday and the period of the Sheaf – the symbol of the harvest that begins in this era of the year. I decided to upload this recording almost as it is, although I had to cope with the problematic quality of the recording which was made from an AM frequency radio station on a pretty worn reel-to-reel tape. Here you c an listen, like me, to the authentic sound of the young Israeli country, valuable and musical. This collection of songs contains an interesting variety of arrangements for the traditional songs: woodwinds ensemble, choirs, chamber orchestras and even a jazz-funk ensemble. I hope that any of you who don’t enjoy listening to this kind of archaic vocal presentation will leave it aside and pay attention to the fascinating instrumentation and arrangements. Listen to the epic arrangement of ‘Ha Lakh’ma anya’ (this is the bread of poverty – the Matza bread) and the entertaining arrangement of ‘Dayenu’ in jazz style with the use of the vibraphone, which in my opinion was a very innovative choice for that period in Israel. The amazing orchestral symphonic for ‘Avadeem hayeenoo’, which can be translated as “slaves we were in Egypt,” sounds like a fancy film soundtrack when the lead instrument is the cello. There are many more interesting examples. This collection is a great model for the performances that were made for those important songs. A lot of them created by Matityahu Shalem, who was one of the leading songwriters of the new Israeli nation in the age of its establishment in the late 1940s. His creations based on the traditional stories from the Bible but with a new kind of secular interpretation and adaptation that fits the general atmosphere of pioneering. 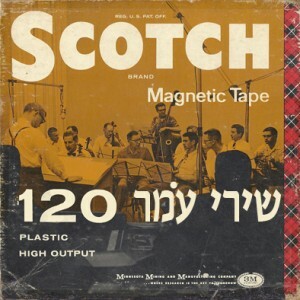 For me, what was very interesting to find in these recordings is the absence of the accordion, which is a blessing since this problematic instrument ruled in most of the musical documentations in Israel until the 1960s. From the late 1960s and onward, the Israeli musicians no longer felt the need to use this instrument for the benefit of other instruments of any kind. I guess it was a better time because the intensive use of the accordion in the earlier age of Israel was a result of sporadic conditions, such as the absence of amplification systems or appropriate acoustic venues and the general need to perform in ‘battlefield’ conditions. For those reasons, this radio show presents the beautiful and creative side of the music creation and performance of the mainstream culture that was produced for the public in the era. Here you have a link for a ZIP file that contains all the songs in separate mp3 files.